At Tar Heel Auto Glass, our customer-oriented team is trained to offer you the highest level of customer service. Serving the Piedmont Triad community 40 years, Tar Heel Auto Glass has become an area leader in customer satisfaction. Take It To Tar Heel! 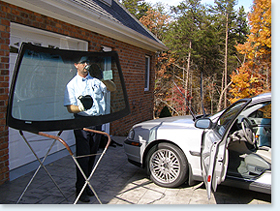 Using the latest automotive glass installation equipment and procedures, Tar Heel Auto Glass technicians are trained and experienced in handling all of your automotive glass needs. We stand behind our work and products – offering you a guarantee with every job. We install original equipment quality automotive glass with customer safety in mind. Our fast, first-rate quality workmanship is service that you can trust. As a member of the Independent Glass Association, our Tar Heel Auto Glass expert technicians are knowledgeable in glass replacement industry standards and procedures.